If you think you saw the most unusual skins then this is not true. 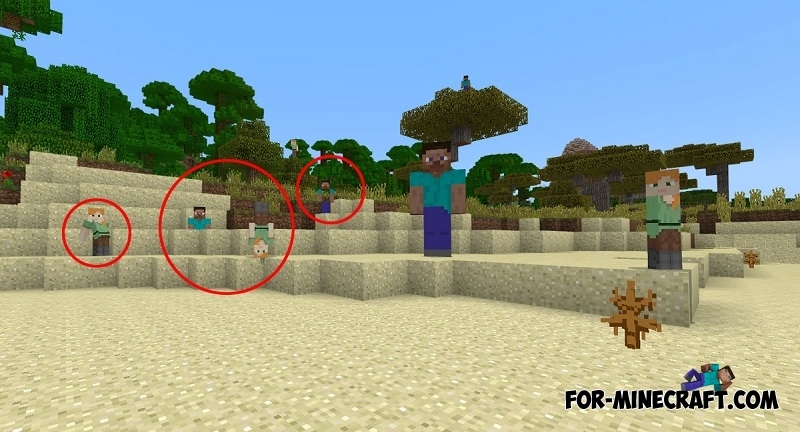 FX Skins is a small pack with completely standard Steve and Alex skins that have been edited. You probably think the creator of this pack just added a mustache or changed clothes, but it's not. This skin pack absolutely does not fit into the rules, because now both characters look amazing, especially if you play on servers. Here you will see Steve divided into two parts, an enlarged or compressed model, an inverted skin and many others. Clearly, it will cause a violent reaction only between other players, no one will see this "horror" in a single game. It's worth noting Mojang has disabled support for such skins in the latest versions of MCPE, so if you want to enjoy an unusual spectacle, then use Minecraft Bedrock Engine 1.2.3. How to install the FX skin pack?